Over the past several years, leading server and storage suppliers have announced and released products that integrate and deliver server, networking, storage, and infrastructure management software components. The ease with which these systems are managed under a single orchestration, provisioning, and monitoring framework will be essential for customer implementation. 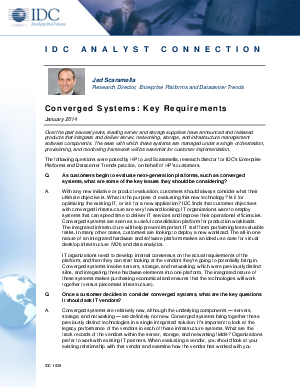 The following questions were posed by HP to Jed Scaramella, research director for IDC's Enterprise Platforms and Datacenter Trends practice, on behalf of HP's customers.